"The Lid": Is The Liberal. Big Government Bubble Bursting ? For months after the 2008 election the propaganda was that the Republican Party was dead, and the United States Was entering the world of European Socialism. 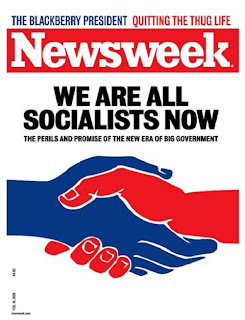 Newsweek even made it a cover story which pretty much recommended that we should stop fighting and get used to it. After all that was the way Obama and the Democratic party was heading, and their popularity was sky high. The mainstream media read the public totally wrong. Voters wanted the President's policies to work, or at the very least, thought that he should be given a chance to make them work--as long as he fixed the economy. There's the rub, the economy is not getting better, and when that broken promise about unemployment not topping 8.4% if the porkulus bill was passed may have been just the thing to make voters start looking at their watch, wondering if the President has had enough time to make his "big government" policies work. 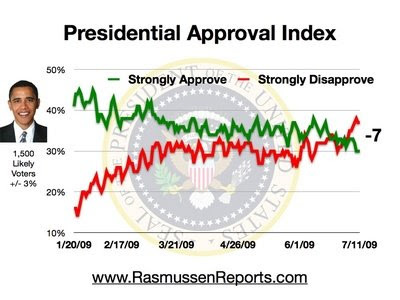 All along the polls have shown that Americans prefer smaller government, and less spending, but now that unemployment has hit 9.5% the President's popularity is declining quite rapidly. The American public remains resistant to big-government liberalism. The air is seeping out of the Great Liberal Hot Air Balloon. American liberals have been hoping, wishing, and praying--okay, maybe not praying--for over a quarter-century for an end to the ghastly interlude of conservative dominance ushered in by Ronald Reagan. Surely it was all a bad dream, a waking nightmare, a bizarre deviation from the preordained path of history. With the Democratic congressional victories in November 2006, the nightmare seemed to be ending. And in November 2008, with the election of Barack Obama and increased congressional majorities, it seemed to be over. A new era had dawned. But did it? Maybe we're now experiencing a liberal interlude, not a liberal inflection point. After all, only six months into the new administration, even a talented hot air blower like President Obama, assisted by friendly gusts of wind from the media, is having trouble keeping the liberal blimp afloat. The stimulus hasn't worked. Cap-and-trade and health care reform are in trouble. The can't-we-all-get-along foreign policy isn't leading to a more peaceful world. And the administration seems to have no idea what to do about Guantánamo. Congressional Democrats are nervous. Even Obama's media base is concerned. At the end of last week, three leading Obamaphiles offered their lamentations. "The fact is, Obama may be blowing a major opportunity for reform," worried Joe Klein. "There's now a real risk that President Obama will find himself caught in a political-economic trap," warned Paul Krugman. "Failure. Overwhelming, amazing failure," was David Brooks's take on the administration's effort to deal with health care inflation--something the president is (according to Brooks) "fervently committed to reducing." Why such long faces? Because they realize that, despite the financial meltdown on the Bush administration's watch and the errors of omission and commission by the GOP over the last decade, the American public hasn't fundamentally rethought their turn in 1980 away from big government liberalism. Gallup reports, "Thus far in 2009, 40 percent of Americans interviewed in national Gallup Poll surveys describe their political views as conservative, 35 percent as moderate, and 21 percent as liberal. This represents a slight increase for conservatism in the U.S. since 2008, returning it to a level last seen in 2004." This despite two decisive Democratic election victories in the intervening years. Gallup also reported that 39 percent of Americans say their political views have become more conservative in recent years. Only 18 percent say they've grown more liberal. Similarly, a recent Washington Post/ABC News poll had Americans favoring smaller government with fewer services to a larger government with more services by 54 to 41 percent--a slightly more conservative result than in 2004. As Michael Barone summarizes the situation, "Americans seem to be recoiling against big government when it threatens to become a reality rather than a campaign promise." Tactical errors by the Democrats and breakdowns in message discipline on the part of the administration are helping the recoil. When Americans hear Vice President Joe Biden say on Sunday, "We misread how bad the economy was," and then watch President Obama step out a couple of days later to explain, "I would actually, rather than say misread--we had incomplete information," they lose confidence in the administration's assurances that they know what they're doing in health care or energy policy. Rahm Emanuel famously said, "Never let a serious crisis go to waste." The American people, to their credit, seem unwilling to let the Obama team exploit this crisis as thoroughly as they'd like to. Now it's up to conservative leaders--and Republican politicians--to do two things: thwart Obama's liberal power grabs and rebuild a conservative governing agenda. The debt that our nation is incurring, trillions of dollars that we're passing on to our kids, expecting them to pay off for us, is immoral and doesn't even make economic sense. . . . President Obama, how are you going to pay for this one- or two- or three-trillion dollar health-care plan? How are you going to pay off the stimulus package, those borrowed dollars? How are you going to pay for so many things that you are proposing and you are implementing? Americans deserve to know. As for developing a coherent and compelling conservative governing agenda for 2012--hoc opus, hic labor est.